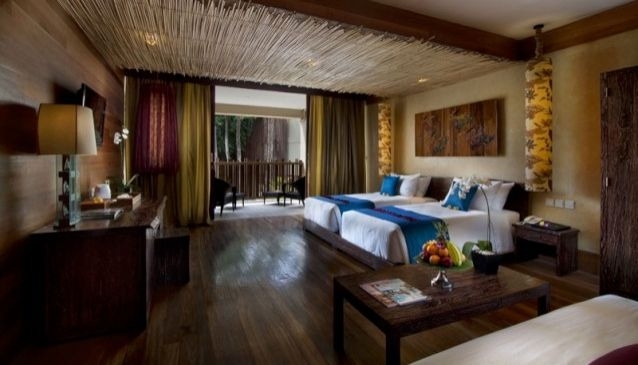 Each suite has been conceptualized as a personal retreat - spacious, luxurious, with all the ethnic charms of Bali. Kupu Kupu Jimbaran is strategically located near the beach of Jimbaran, with the exclusive boutiques and top notch dining options on the ground level of the hotel. Guests experience a wondrous introduction to beauty and wellness in our Spa by L'Occitane, the most sumptuous spa indulgence in Bali, inspired by Provence in France, in 14 treatment rooms, reflexology lounge, beauty salon, spa café and also L'Occitane retail boutique to pamper your body. Jimbaran Beach Club is just a 7 minutes walk from the lobby and 3 minutes by buggy. 350 m² beach landscape, promises gorgeous sunsets, indulge in high-quality food and beverages.